↑ Dates of incorporation. Retrieved on 2008-07-11. 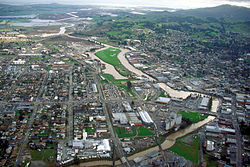 ↑ Population Finder: Petaluma city, California. U.S. Census Bureau. Retrieved on 2007-12-01. Tauli yang miyalilan ining bulung anyang 20:52, 9 Marsu 2013.